Forest House is a luxury wilderness lodge located in the heart of the Boreal Forest on the shore of an unnamed lake in Northern Saskatchewan. The log buildings and the surrounding gardens have been lovingly carved from the precambrian rock over the last three decades. Everything from the sun-lit dining room, to the wilderness trails, to the solar-powered electrical system, have been carefully located and constructed to showcase the many natural attributes this unique getaway offers. Forest House is the perfect setting to escape the hustle and bustle of everyday life; to experience the peaceful serenity of the northern forest; to nurture the soul. Here, there are no clocks... no schedule... no agenda. The day is yours to relax... to explore... to do as you wish. Re-vitalize yourself in a place where time stands still. At Forest House, you are the only guests. The magnificent lodge, the cozy fireplaces, the comfortable deck, the scenic gardens, and everything else Forest House offers are completely at your disposal. While tending to your every need, our staff recognizes this is your time and respects your privacy. Forest House is yours. Late Spring/Early Summer: In late June/early July, the Boreal Forest awakes, with abundant growth and new life everywhere. The days are long and lazy, and there is minimal darkness. This is an excellent time to experience the re-birth of the local flora and fauna, and to enjoy the extra daylight hours. Summer: Mid-July/early August offers a warm, temperate climate. The days are still long, and our gardens are alive with vibrant colours and scents. It is the perfect time to bath in warm sunlight, and revel in the wonders of Mother Nature in full bloom. Late Summer/Early Fall: Mid/August/late October is a time of transition. Shorter days unveil spectacular starlit nights, often augmented by brilliant Northern Lights. The colours of fall begin to appear in the forest, as it prepares for the winter ahead. It is a wonderful opportunity to enjoy crisp, clean air and late-night campfires under a stellar light show. Winter: During the winter months, the northern Boreal forest sleeps under a blanket of snow. 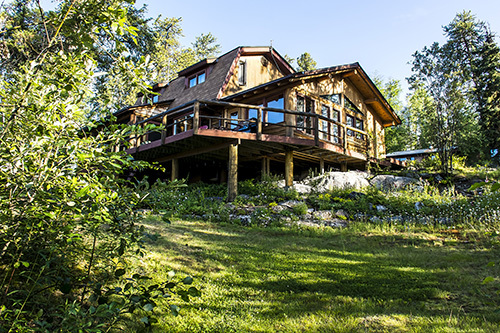 Once the lakes are iced-in, Forest House is easily accessible by ski or snowmobile. The forest may be asleep, but the days are alive to experience the many wonders winter brings to the Canadian Shield. Copyright © 2013 Forest House Wilderness Lodge. All Rights Reserved.